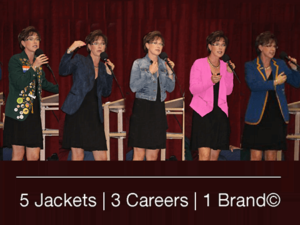 Inspirational speaker and best-selling author, Nikki Bush, takes you behind the scenes of what it takes to build a strong brand by sharing the lessons she has learnt from wearing five different jackets and building three different careers. Today she is a stand out brand of one, a thought leader who inspires other women to aim higher while staying true to who they are. This energetic and creative presentation highlights how holding on to what’s important to you, connecting with others, finding mentors, being prepared to make choices and doing some hard yards are all in a day’s work, no matter what your age, stage or position in the work place. Nikki will share her insights and some poignant personal anecdotes as she takes you on a journey to being the best you that you can be. Every day, every moment, sets you up for what comes next – for being more you. Nikki Bush is a professional speaker and best-selling author helping her audiences make sense of a fast-changing world – one in which individuals must increasingly and continuously ‘make the path by walking on it’. You have to ‘do’ in order to ‘be’. As a multi-tasking mother and entrepreneur Nikki walks this journey with us every day or perhaps, more accurately, she does it all on the run, as most of us do! Her work is fueled by her trademark passion for play, connection and relationships. Her approach is simple, her messages profound and her advice practical and wise. Nikki’s high impact presentations make her memorable long after she has left the stage.